The 2015 open day at the Denge sound mirrors near Dungeness in Kent is on Sunday 19 July 2015. The opening times are 10.00-17.00, with last entry at 16.30. The RMCP will be present all day to talk you through them and help with any questions and we ask for a donation per person to cover our costs for the day. You will need to park at Lade car park and follow the signs to make your own way to the Mirrors, where staff will be positioned at the bridge and on the island. Last entry 4.30pm. Suggested donation of £2 appreciated. The RMCP events are the only way to visit the Denge sound mirrors. The events are always popular, and well worth going to. Please note that I have absolutely no connection with the RMCP. Make you sure that you confirm the details of the open day with them before going – do not rely on my Sound Mirrors website! The Romney Marsh Countryside Project’s 2014 “Echoes From The Sky Open Day” at the Denge listening mirrors near Dungeness in Kent is from 10.00 to 17.00 on Sunday 20 July 2014. The RMCP events are the only way to visit the Denge mirrors. The events are always popular, and well worth going to. An opportunity for residents and visitors to visit the site under your own steam. The RMCP will be present all day to talk you through them and help with any inquires … Suggested donation of £2 appreciated. Full details are at the Romney Marsh Countryside Project website. Anyone planning to attend should confirm details with the RMCP before travelling. ‘Sound Mirrors’ -Denge, Dungeness, Kent. Sound Mirrors explores the monumental remnants of a dead-end technology and the people who visit them. The three concrete ‘listening ears’ at Denge near Dungeness in Kent are the best known of the various early warning acoustic mirrors built along Britains coast. This is the first film produced by director/ photographer Morgan O’Donovan with architect Stephen Beasley. Filmed August 2009. Denge Sound Mirrors page at Historvirus. 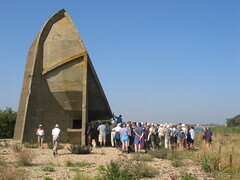 Following from an open day on 8 July 2012, there is a free non-booking guided walk out to the Denge sound mirrors on the afternoon of Sunday 12 August. The RMCP events are the only way to visit the Denge mirrors. The walks are very popular, and well worth doing. Full details from the Romney Marsh Countryside Partnership website. Anyone planning to attend should confirm details with the RMCP before travelling.